The closest airport is Navegantes Airport. 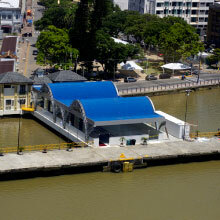 From there, there are two ways to reach Itajaí: by the BR 101 highway, or across the Itajaí-Açu river, taking the ferry that links Navegantes to Itajaí. 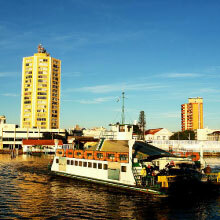 Ferries cross the Itajaí-açu river between Navegantes and Itajaí, a journey of just two minutes. With infrastructure to receive cruise liners, Itajaí is one of the main ports of call for the majority of Maritime Companies, and is also used as a point for boarding and disembarkation of passengers. • BR 101, BR 470, SC 470 (Rod. Jorge Lacerda) or via the BR 486 (Rod. Antonio Heil): The best way to come is via the Acesso Sul (Tourist Highway), which is the fastest route, and takes you directly to the center of the town where most of the attractions are located. • Rodovia Oswaldo Reis: Connects Itajaí and Balneário Camboriú, including various Beaches along the way, and ending at the Via Gastronômica, with its many bars and restaurants. • Terminal Rodoviário Internacional (International Bus Terminal) – TERRI – Av. Adolfo Konder, 1201, São Vicente, Tel. +55 47 3241.6500. • To reach the center of town, take the M/06 bus route – (TERRI / Centro / Rua Brusque / TERRI). For more information:Services / Transporte / Ônibus.